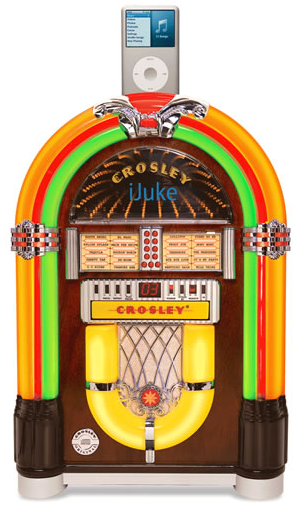 The Crosley iJuke Premier Jukebox Is A Modern Entertainment Center With Style. Crosley’s iJuke Premier finally fills the need for something that both looks good and boasts plenty of functionality. A nice addition to any game room, home bar, or rec room. The Crosley iJuke Premier brings back the simpler times rockin’ around the jukebox, but in a no fuss tabletop version. Dock and listen to your iPod and CD’s with the jukebox’s dynamic full range stereo speakers. Enjoy the eye catching neon lighting and stylish wood finish.